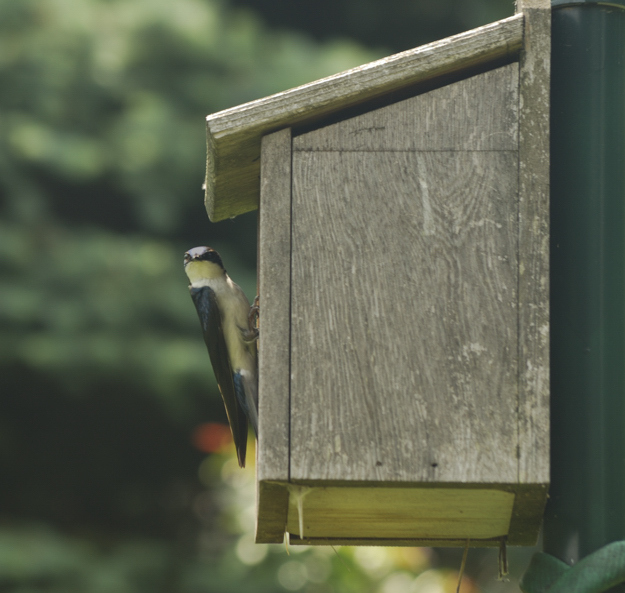 My tree swallows left the nest box this morning. There were three fledglings this year. The one brave individual was particularly worrisome over the past two days. It kept trying to fly; but just wasn't ready. I had to put it back in the box three times. They all managed to leave; as a family, early this morning. They will be missed in the garden. You tend to become immune to the repeated aerial attacks; after awhile. I do not know if others experience this; but after the fledglings leave, I never have another tree swallow in my yard until next March. Once they leave the nest, they are gone until next year. I did have my first ever successful bluebird nest this Spring. They are re-nesting right now. I am sure that a house wren will take over the tree swallow box soon. they always do. We need the rain that we were promised. 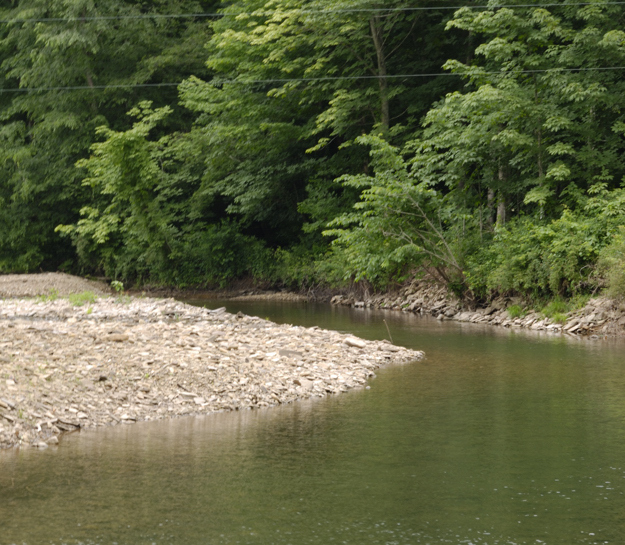 The upper reaches of our streams barely have enough water to cover a trout up. I stopped at several locations this week and found plenty of trout and smallmouths. In one spot today on the Tygart; I could look upstream from one spot and see 11 browns and one 15 inch smallmouth in prime feeding lanes. There were a few sulphurs flying and 2 of the browns were actively feeding on the surface. I also saw one late green drake spinner land in the water. It didn't last long. I had my dogs at Shavers Fork this evening and saw quite a few nice smallmouths. They were nosing right up to the shoreline, barely covered with water. Every one was within 6 inches of dry ground and waiting on something to move. This is the time of year that is very enjoyable to fly fish. I for one do not care if I'm catching 12 inch trout or 12 inch bass, either is just fine with me. We have to remember that a lot of our so called "trout streams" are in reality smallmouth bass waters; which receive trout allotments. The hatchery trout are just visitors. We really need some rain to raise the water levels and keep the temperatures down. I believe that my tree swallows will fledge soon. There are at least three in the nesting box. The odd thing about tree swallow behavior in my yard; is that I never see another tree swallow in my yard, once the young leave the box. There will not be a swallow present here until next March. I seem to be over-run with chipping sparrow young this year and there are at least four pairs of house wrens busily raising young and re-nesting. A phoebe had its fledgling sitting on one of my pole bean tepees, yesterday. House finches, downy woodpeckers and the white-breasted nuthatches are busy; filling gaping mouths. The bluebirds are getting ready to nest again. I can hear orioles being tended to in three different spots. The great-crested flycatchers and yellow-billed cuckoos have quieted down. I haven't heard the red-eyed vireos in a few days. I am sure that they will have mouths to feed soon. This is the second year in a row that no rose-breasted grosbeaks or pine siskins are around here. I have three chimney swifts flying around regularly, in a few days there will probably be eight or more. The ravens have some rowdy young over on the hill. I haven't heard any killdeers over at the ball field, they apparently did not nest there this year. This is the season of renewal, be observant and enjoy. Carolina Wrens: Need a little help. It has come to my attention that several members of the West Virginia birding community have experienced a reduction in their Carolina Wren populations over the past two bad winter seasons. I have not experienced any notable reductions here and I enjoy harsher winter conditions than most. I know that my local population is starting their second nesting here right now. I have only been back in this area for about ten years, but one of the first things I did upon return to the area was to hang some useless boots. I am not going to mention any manufactures names; but in my time as a turkey hunting guide in the Deep South, I received many pairs of "hunting boots". They all leak and keep you wet, unless they are made of rubber; enough said on the subject. I have hung these wonderful boots around on the property and they get regular use as winter roost sites. I also bought a few winter roosting things; I don't remember where I got them, but they came in sets of three. One of them, the birds wouldn't use for some reason. The other fell apart as soon as it got damp. But, this one which is made of spruce needles is at least 8 years old and is used all winter. Actually; from about October on. I have seen four Carolina Wrens crowd into this nesting thing at one time. They just keep piling in; until it is full. There is at least one wren in this every night. This last photo is some kind of a guaranteed waterproof / snake-proof "hunting boot" that leaked so bad that your feet were actually floating in water. I said that I wasn't getting into that didn't I? Anyway, this past winter; I watched seven Carolina Wrens go into this one boot, on a cold evening. This one is in my gazebo. I do still worry about my wrens on frigid nights; when the thermometer is below 10 and the wind is fierce. I usually find myself staring at the suet; until one shows up. But they always appear; after their cozy nights spent in their roosting boots. If you want to help out your wrens this winter; just hang some boots, they will be much appreciated. The next few weeks will be prime time for viewing the exquisite mountain laurel show of the highlands. I do not believe that there is a finer place to do this than Tucker County, WV. 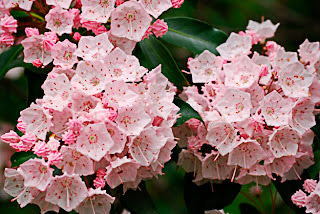 One of the easiest spots to find these mountain beauties is the Canaan Heights area; along Rt. 32, south of Davis, WV. The rocky, acid soils of this area produce some of the best colors that I have seen. I was there on June 6 and they are beginning to bloom, not very many though. We have had some abnormally high temperature over the past few days; this may encourage them to open up a little early. The main show should begin next week. They are usually pretty nice for about two weeks. Do yourself a favor and do not miss the show. Now is the time to plan a trip to the Thomas, Davis, Canaan Valley and Blackwater Falls area of Tucker County; for some great outdoor photography experiences. Thank you for your purchases !! 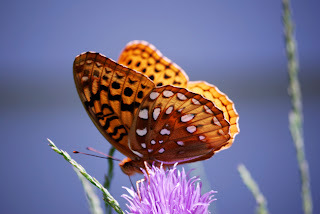 The Great Spangled Fritillary (Speyeria cybele cybele) is a common butterfly throughout the High Virginia's. It is a butterfly of openings near woodland areas. This species can be found from late May - October. There are eight species of the Longwing subfamily that may be found in our area. The Great Spangled is the largest of the species that we commonly see. Members of this family are long-living; up to six months. Older specimens are often beat up and ragged looking. The host plant for caterpillars is one of the many violet species. Twenty-seven species of violet are known to occur in West Virginia. 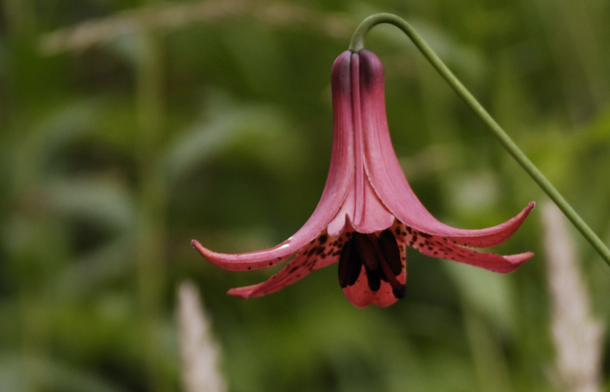 This is the reason that the members of the Fritillary family are so widespread. Preferred nectar sources of the Great Spangled Fritillary are milkweeds, thistles and joe-pye weed. The Canada Lily (Lilium canadense) grows in meadows and swamps throughout the region; but is more common in the highlands. This photo was taken in Randolph County, WV. The Canada Lily is something to be on the lookout for; when you are afield in the High Virginia's during the months of June and July.